My book on "Money Secrets of the Amish" by Lorilee Craker, arrived at a good time, as we had to make a quick trip out of town yesterday. I love to read while travelling, although it does make me sleepy. This book will certainly keep you interested in reading though. The book I found was well writen and tells a story of how the Amish people save money and do alot of bartering. 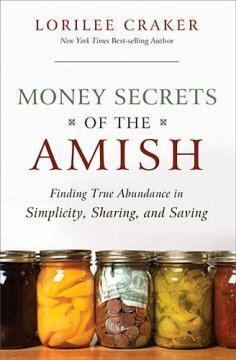 Lorilee writes on how the Amish save money and then incorporates her own way of how those of us that aren't Amish, can do their own money make overs and save. Although there were basic ideas here on how to save money, I liked reading about the Amish lifestyle and how everyone in the community works together to save money. It's a very interesting read.After reading this book, I thought even more of how it would be interesting to visit an Amish community. The book really does help you to see how simplicity can add up to savings. Our sponser would love to give away a copy of one of these books to a lucky Canadian or US reader.A random draw will be held by Random.org on June 28,2011 from all entries recieved. Tell me if you've ever visited an Amish community and where. I would love to win and read this book. I live walking distance from St. Jacob's and often see horse-drawn buggies going down the street! There is a large community in Clare. I have visited an Amish community in the Kitchener/Waterloo, Ontario area. We have visited/lived in/purchased from Amish communities in PA and OH. I would love to go back with the kids at some point as a vacation. No, I have not had the privilege of visiting an Amish community. email subscriber to Stretching the one income dollar. I live in North East Ohio. I frequently shop at Amish stores. I usually shop in Middlefield or Mespotamia. I have visited an Amish Community before in Lancaster, Pa. I happen to love their ideals and lifestyles, although I couldn't live without my phone or electricity. I think they are the "Greenest" people on Earth. No, I have never visited an Amish community, but I have been inspired by their simple lifestyles. My husbands extended family is from Upstate New York. One of my favorite parts is seeing the Amish communities. I never visit but watch shows on them.. I've never visited Amish country! I have never visited an Amish community . I followed oneincome on twitter. Never visited an Amish community but would love to. I've never visited an Amish community, but there's a large one nearby in Grabill, Indiana and other surrounding areas :) *Thanks* for the giveaway! No, but I would like to! I have never visited an Amish community, but would love to someday! No, have not visited a Amish site.